Zara White Floral Lace Dress Size S. White under slip included. Used but in good condition. I’m having a big clear out so please check out the other items that I’m selling! Zara White/navy Striped Pleated Midi Skirt Size S 8. Condition is Used. Dispatched with Royal Mail 2nd Class. It has 2 string ties attached half way down the front, which are sewn into the seam where the frill is attached to the main part of the blouse. It is a semi see through black & white bolero style blouse. Ladies ZARA White And Red Stripe Summer Midi Dress Size XS. Condition is Used. Dispatched with Royal Mail 2nd Class. 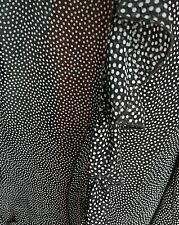 Beautiful Zara Blouse XL. Condition is New with tags. Dispatched with Royal Mail 2nd Class. Gorgeous Zara spotted dress size M. Only worn once perfect condition. Zara WB Collection Sleeveless White Vest Cami Top Assymetric Long Small - 8. Never worn. 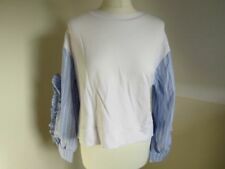 Zara Womens White Shirt Size Xs. Condition is Used. Worn once - perfect condition. Dispatched with Royal Mail 2nd Class Recorded. Zara total look, top and trouser set, both size s, sold together Unusual set, the long wide legged trousers have popper button details and the longer style sleevless top has slits up the side giving it a flatteting finish. The pieces can be worn separately or together for a complete look. Please have a scroll through my other listings, I'm happy to combine P&P for multiple items purchased. Feel free to drop me a message if you have any questions or would like additional info/pictures. Happy bidding! white tie back top . Condition is Used. Dispatched with Royal Mail 2nd Class. It has a bardot neckline for wearing on or off the shoulder. 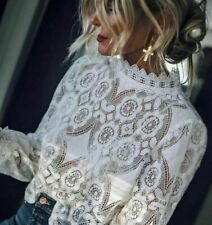 This is a stunning ladies white blouse/top from ZARA. however the neckline is adjustable using the draw ribbon. Machine washable. The main body is lined and the sleeves are not so they are sheer. Zara, Dress, Size XL, Used. Zara Dress Small. Condition is Used. Zara Pretty Slip Top | Cream And White | Size 12. Condition is Used. Dispatched with Royal Mail 1st Class. 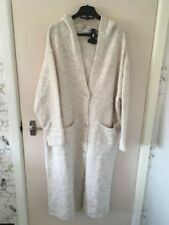 ZARA Cream Off White Boucle Coat Size S. Great evening wear coat. Textured knit with gold zip detailing on the front and pockets. The liner inside ripped early on so I’ve repaired with similar cotton thread and hand stitching. Ladies Zara White long sleeveless smart jacket. Size L to fit 12/14 (I am a 14 but have DD bust and it’s just a little small) would fit size 14 with smaller bust. Tags removed but never worn. It has two tiny marks(see pics) which will come out in the wash. Length shoulder to hem 91cm. Please read before bidding: Items will be sent Royal Mail 2nd class, I receive proof of postage and cannot be held responsible for lost parcels. If you would like your item tracked then please email me before making payment and I will amend the final value to include the recorded postage. I will post items out within 3 working days. Please check out my other items. Thank you for looking. Zara Peach Floral Top Size S. Condition is Excellent. Dispatched with Royal Mail 1st Class. White/Black Spotty. high neckline, sleeveless, elasticated bodice with frilled hemline. length from top of shoulder to hemline: 20.5". Lace, see through. one button fasten at the back of the neck. SIZE 8/10 EUR S. I would like to make sure you are happy. ALL problems can be sorted. Much Appreciated. Excellent condition, only tried on, never been worn. Literally only ever wore this swimsuit on the pics. Perfect condition, Zara swim range. Crisscross tie back so it’s adjustable and you can pull it in to support bust and pull in waist 💛. Never worn. Zara Tassel Top Size Small. Condition is New with tags. Dispatched with Royal Mail 1st Class. Zara Top/blouse Small. Condition is Used. Dispatched with Royal Mail 1st Class. Zara White Cropped Blouse S. Condition is Used. Worn once. Dispatched with Royal Mail 2nd Class. Lovely top by Zara in used condition. ZARA White Bodycon Sleeveless Top. White Zara Skinny Distressed Jeans Size 8. Condition is New with tags. Dispatched with Royal Mail 1st Class. Button front, floral embroidered detail, button front and collars.